Hulu and Lionsgate today announce that UNBANNED: THE LEGEND OF AJ1, the powerful and inspiring true story of how Air Jordan 1 (AJ1) transcended sport to become a global phenomenon, will stream exclusively on Hulu. From first time filmmaker Dexton Deboree, the documentary interviews culture-defining titans, including NBA Hall of Famer Michael Jordan himself, Quincy Jones, Spike Lee, Lena Waithe, Carmelo Anthony, Chuck D, and Phil Knight among others, to explore how AJ1 was not just a sneaker, but a worldwide movement that broke through barriers of race, age, and gender to define the culture in which we now live. Lionsgate acquired the documentary which is set to make its exclusive streaming debut on Hulu on February 14. The Sicilian Tenors, the international singing sensations who blend classic opera with Rat Pack shenanigans, will be recording their first television special on Sunday, November 25 at 3 p.m. at the historic Weinberg Theater in Frederick, MD. Hulu has given a straight-to-series order to Wu-Tang: An American Saga. The upcoming drama series created and written by Alex Tse (SuperFly) and Wu-Tang Clan front man The RZA, has received a 10-episode order from Hulu and will be executive produced by Imagine’s Brian Grazer (Empire, Genius) and Francie Calfo (Empire, Genius), Wu-Tang Clan’s The RZA and Method Man, and Tse. Imagine Television creative executive James Seidman will oversee the project for Imagine. WE’LL MEET AGAIN returns for a second season of compelling human stories of hope, courage and resilience, exploring some of history’s most dramatic events through the personal experiences of those who lived through them. Executive produced and reported by Ann Curry, WE’LL MEET AGAIN tells the stories of ordinary people caught up in the tides of history who are seeking to be reunited with those who helped them – either physically or emotionally – survive these transformational events. Produced by Blink Films in partnership with Ann Curry, Inc., WE’LL MEET AGAIN Season 2 premieres Tuesday, November 13, 2018, 8:00-9:00 p.m. ET (check local listings) on PBS. See the trailer here. Get ready for a summer full of Double Dare, as Nickelodeon sets Monday, June 25, at 8:00 PM (ET/PT) as the premiere date for the iconic game show’s return. 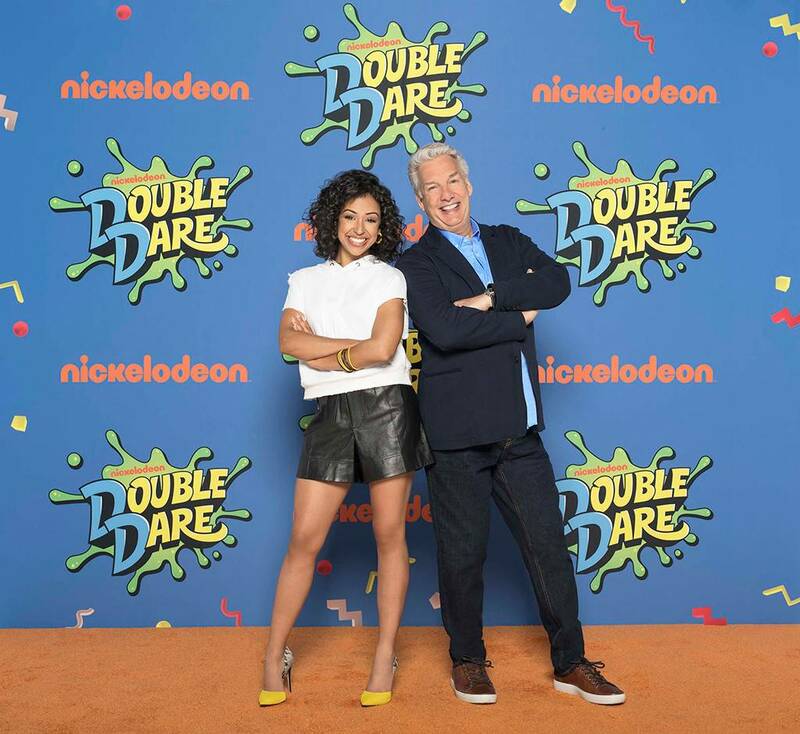 Digital creator and actress Liza Koshy has been tapped to host the brand-new version of Double Dare, where a new generation of fans will compete in the messiest and most physically challenging competition of their lives. Anson Mount has been tapped to play Captain Christopher Pike of the U.S.S. Enterprise in the soon-to-film second season of Star Trek: Discovery. Mount, who was born in Illinois and raised in Tennessee, counts among his many film and television credits Crossroads, Smallville, All the Boys Love Mandy Lane, Lost, Dollhouse, Straw Dogs and Non-Stop, as well as the recent series Hell on Wheels and Inhumans. YouTube has announced the completion of principal photography on VULTURE CLUB starring Academy Award-winner Susan Sarandon and award-winning actors Edie Falco and Matt Bomer. In VULTURE CLUB, a veteran emergency room nurse secretly struggles to free her grown son, a journalist, from capture by a terrorist group. After running into roadblocks with government agencies, she discovers a clandestine community of journalists and advocates who might be able to help her. VULTURE CLUB will debut in theaters and then on YouTube Red later this year. The Alienist opens when a series of haunting murders of boy prostitutes grips New York City. Newly appointed police commissioner Theodore Roosevelt (Brian Geraghty) calls upon criminal psychologist Dr. Laszlo Kreizler (Daniel Brühl) and newspaper illustrator John Moore (Luke Evans) to conduct the investigation in secret.